Our team has seen an increase in repeat business the last couple months. This speaks to our ability as web developers and professionalism regarding customer care. Its really rewarding that this repeat business is not for redesigns but rather for other divisions within the original organization. ITW Illinois Tool Works Inc. is a Fortune 200 company that produces engineered fasteners and components, equipment and consumable systems, and specialty products. Today, it employs nearly 60,000 people in 825 business units across 52 countries. We originally produced a website for ITW Linx which lead to ITW Envopak which was just launched. We produced a really cool site for St.John’s Catholic Church out of Indianapolis. This site includes a number of bells and whistles including light box multimedia. 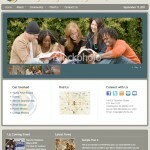 When the Arch Diocese saw St. Johns we were contacted about making a site for them. This is site is launching by the end of October. You can see a sneak peak on the thumbnail to the right. J.A. Air Center occupies more than 85,000-square-feet of hangar; 10,000-square-feet of office space; and employs close to 100 people. J.A. is now one of the Midwest’s most-complete avionics, maintenance and modification centers. J.A. Air retained Brian & his team for a brand new project launching by the end of the year.